I wish I could figure out exactly what it is that I routinely enjoy about Ben Owen's work that differentiates it from others plowing roughly the same territory. As before, the best I can do is posit that it revolves around choices made and that those choices, in one sense or another, coincide with my taste, with what I would do or, more likely, what I wouldn't do but would look back and think I should have done. 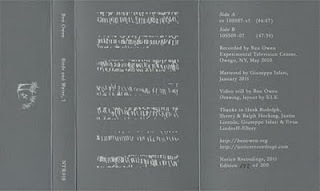 This cassette release (which I heard on disc) contains two substantial sides, over 47 minutes each, both realized at the Experimental Television Center in Owega, NY in 2010, using A system developed by David Jones (presumably not our David Jones) in 1974 that includes sequencers, oscillators and image processors. Side A shifts from area to area, some intense and full, some all but silent, the latter often redolent, on closer examination, with hums and wooly static, here smooth, there very, very rough. 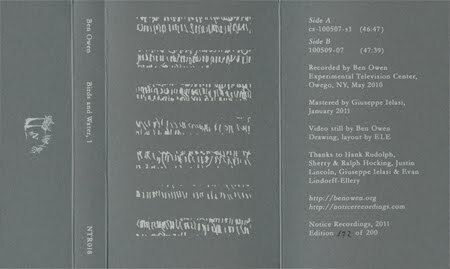 What to say except that both the selection of sounds as well as their duration/sequencing sit perfectly, keeping one rapt and delighted. Side B is a bit of a tougher go only because it's essentially a single drone, kind of a thicker variant of a Sachiko M piece. There are striations, though, and they're apparent on reasonably close listen even before the ocarina-like, wavering tones appear. The long hum. I haven't had the opportunity to really lay this out loud, though I imagine it would sound great. I enjoy it as is even if I somehow find it missing that extraordinary level of attention that Sachiko manifest. Still and all, very fine. A strong, absorbing recording, well worth seeking out. Hi Brian, I would like to send you some stuff from my label for reviews. If you are interested, check it out! Very kind and appropriate words. We enjoyed working with Ben on this tape very much. It's still available for anyone who is interested. Get in touch if so.